Exploring change, communications, control issues, and emotions is often the best way to begin to understand what is causing conflict in the workplace, and what can be done to curb or control the situation. Once there is a basic understanding of these elements, it is much easier to develop a management strategy that constructively reduces stress in the workplace, which in turn will decrease absenteeism, improve productivity, and ultimately influence health care costs. The blending of dispute management and workplace stress may not be as glamorous as Reese’s blending of chocolate and peanut butter, but it is a critical joining to help reign in health care costs. How does it work? Dispute management looks at what is generating conflict in the workplace and identifies the factors causing stress on employees. Stress has a significant impact on an employee’s health, which in turn affects absenteeism, productivity, and ultimately—health care costs. Innovative management practices may help prevent the types of stress that, if prolonged, are the most damaging to employees. Significant health issues triggered by stress are heart disease, strokes, diabetes, and some forms of cancer, along with a host of common ailments. Conflict can never be eliminated, and can have some positive results, such as stimulating creativity; however, prolonged conflict and its incubation of harmful stress does need management. If workplace conflict is to be constructively managed and reduced, then investing a bit of time and resources sooner rather than later will pay large dividends. What is causing conflict and what is keeping it going? Sometimes the root cause of conflict in the workplace is also what is fueling the stressful environment. Four fundamental elements to explore include: change, communication, control, and emotions. Change is often considered the number one cause of conflict in the workplace. It does not matter if the change appears to be major, such as shifting work schedules; or minor, such as moving a person’s desk to a new location. Communication takes many forms—direct verbal, which includes face-to-face that incorporates not only the words, but also all the nonverbal facial expressions and body posture. Then there is the indirect verbal, such as over the phone with only words and intonation. As communication technology expands, more communication is non-verbal—e-mails and text messaging. This may produce incomplete communication and may increase the probability of misunderstandings. Control can be subtle and unspoken; the “I control if you work here any longer”, to the covert of not sharing information with other team members. People who believe that they have power or influence over others may use their position to abuse those they do not like or whom they perceive can reduce their control. Emotions not only include the highs and lows a person may feel, but also their ability to control the extent of those swings and the impact it has on co-workers. 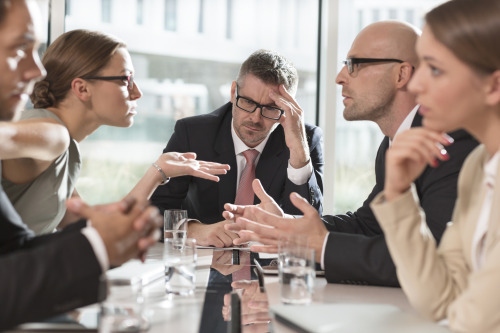 Exploring these four topics is often the best way to begin to understand what is causing conflict in the workplace, and what can be done to curb or control the situation. Once there is a basic understanding of these elements, it is much easier to develop a management strategy that constructively reduces stress in the workplace, which in turn will decrease absenteeism, improve productivity, and ultimately influence health care costs. First, look for primary sources of change: organizational, departmental, and management personnel. Begin with an organization wide review—have there been any organizational changes, including policies and procedural elements? Are offices moving or closing? Has there been or are there conversations about a merger or acquisition? Have there been changes in the organization’s structure or in upper management? After the overall review of the business structure, upper management, policies and procedures, then look further down the organizational levels—divisions, departments, groups, and teams. What has changed? Who is “in” and who is “out”? Second, review types and frequency of communication. Is everything done by texting, or face-to-face meetings are the norm? Is communication a 24/7 phenomenon? One of the biggest “stressors” in today’s workplace is e-mails and texting that inundate workers morning, noon, night, weekends, holidays, and vacations. Third, assess how much control managers have over their division, departments, groups, or teams. When projects are assigned to a group or an individual, is there a lot of micro-management and second-guessing, or are employees empowered to create the design or develop the product? Telling a person that they are in charge of a project, and then telling them what they are doing wrong, always creates stress. When projects or tasks are assigned, it is assumed that the individuals are qualified to do the work. If they are not, then training must be an integrated element. Some individuals may not have control in areas of their personal life, and may take steps to assert control in an effort to usurp “power” and control co-workers. These individuals are missing basic recognition and validation in their lives. These issues are best dealt with directly with the individual. There has been an increase in control issues, since most individuals typically point out what has been done “wrong”, rather than to acknowledge what was done “right”. Continued criticism is a major workplace stressor. Fourth, determining how stress is affecting a person often shows up in how they manage themselves emotionally. Do they “fly off the handle” at the slightest provocation? Are mood swings extreme and frequent? One early sign that emotions may be negatively impacting co-workers, is an increase in requests for transfers from a unit or team. If the telltale signs of stress appear, do not ignore them—problems do not go away, they just keep growing. Early warning signs include increased rates of absenteeism—look especially for Monday and Friday absences, or just before a project deadline. Review employee turnover statistics. Has the organization historically enjoyed a less than three percent rate, and is now facing a sixteen percent rate? Before implementing changes, be sure to include all those individuals who will be impacted. Disclose the rational for the change, and then provide time for those affected to discuss policy, procedural or staffing changes, and provide feedback. It is surprising how those in the trenches can see flaws that were overlooked in the initial planning process. Finally, allot sufficient time for those who will be impacted to adjust to the changes. In one company, a key manager was moved to a division out-of-state, and her team only learned about the change when they came to work on Monday morning and a new person was there! Pay attention to how employees talk to one another. Is there congenial “chit-chat” or is there a lot of “sarcasm” and “caustic” remarks? Is one person on the team consistently left out of the discussions? Do they tend to sit at the back or to the side? Do they typically push their chair away from the table or otherwise appear to be disengaged? One medical device company learned the hard way when a silenced, younger employee, who did not have a doctorate, and who was continually ridiculed for being naive, left the company. He proceeded to join a competitor, who patented his “shot down” idea, thus providing his new company with a significant new product that captured a huge share of the market. In meetings, are certain individuals sidelined; do they seem to “shut down” or appear distant? Be on the lookout for people who want to control everything—projects and people. Individuals who are “power mongers”, who develop dictatorial monarchies within the organization, can be the biggest, single generator of stress on their coworkers. One employee, who was given a project by a vice president, but who reported to a project manager, found that no matter how hard he tried, he could never please the manager. The interaction between the two became so stressful for the employee that he developed significant health issues—missing months of work. Some individuals have a hard time controlling their emotions. They fly off the handle and verbally “brow beat” those who are not able to confront the bad behavior. Working with someone who is emotionally unpredictable creates stress. Sometimes these emotional outbursts trigger emotional outbursts from others. The situation escalates and productivity plummets. The easiest thing to do is regularly conduct a Stop-Look-Listen survey. It is easy to stop and review absentee records, look at retention records, and listen and observe how people communicate and interact with one another. When reviewing absentee and retention records, also review the number of wrongful termination cases. Note what claims are made. Are there claims of a hostile work environment, discrimination, or similar issues? These may indicate that change, communication, control, and emotion issues exist within the organization. When listening to how people communicate, be sure to pay close attention to how people interact with one another. Note body posture; does the listener repeatedly cross his or her arms. This is a sure sign they are not receptive to the speaker’s ideas. Are speakers interrupted or cutoff before they can complete their presentation or is the presentation followed by a snide remark by the team leader? These observations will be indicators that the work environment may be creating stress, which in turn will increase absenteeism, decrease productivity, and invariably negatively impact healthcare costs for the organization. If these issues are present, then it is time to consult a dispute management specialist, and get the organization back on track. See You and Stress, Quickreadbuzz.com, 2015/12/09. Nancy Neal Yeend founded The End Strategy (TES), a Portland, OR-based dispute management and mediation firm. Ms. Yeend is a seasoned and accomplished professional, as well as a prolific writer, with a focus on conflict management and resolution. She is adept at developing programs for business, governmental entities, and not-for-profit organizations involving workplace related conflict. In addition, she is a skilled trainer and experienced course designer, specializing in communication, negotiation, problem solving, and dispute management. She mediates business and contract related matters at all stages of litigation: pre-suit, trial and appellate.